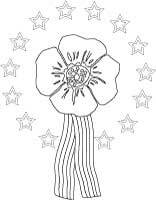 Patriotic poppy coloring page with stars, poppy and ribbon. Buddy poppies are worn worldwide on November 11 (Veterans Day, Remembrance Day), ANZAC Day in Australia, and in the USA also on Memorial Day, in May. Click link or picture to open a full page buddy remembrance poppy coloring page in PDF format. You might also wish to print and color in our Peace Symbol Poppies coloring page.